A Past Master's jewel presented in 1831 to William Cuscaden by Benevolent Lodge No. 142, New York. Th e number of the loyal faction was changed to No. 28 on June 8, 1839, to become Benevolent Lodge No. 28. In June of 1849, the lodge helped to form the Phillips Grand Lodge, but on August 14th, the Master and a faction take the warrant and acknowledge the legitimate body. From this time to the Union on June 7, 1858, there are two lodges known as Benevolent Lodge No. 28. [See Benevolent No. 28, Phillips Grand Lodge]. The original warrant of 1806 was returned to Benevolent Lodge No. 28 of the legitimate body on June 7, 1883. Benevo lent Lodge No. 28 merged on February 13, 1974 with Independent Royal Arch Lodge No. 2, New York, NY. Benevolent Lodge No. 142 was warranted on September 3, 1806. A new warrant was granted on December 6, 1837, the Master and certain members having helped to form St. John's Grand Lodge and having withheld the warrant from the loyal members. (The St. John's faction became Benevolent Lodge No. 1 under that jurisdiction. )<br>The number of the loyal faction was changed to No. 28 on June 8, 1839, to become Benevolent Lodge No. 28.<br>In June of 1849, the lodge helped to form the Phillips Grand Lodge, but on August 14th, the Master and a faction take the warrant and acknowledge the legitimate body. From this time to the Union on June 7, 1858, there are two lodges known as Benevolent Lodge No. 28. [See Benevolent No. 28, Phillips Grand Lodge].<br>The original warrant of 1806 was returned to Benevolent Lodge No. 28 of the legitimate body on June 7, 1883.<br>[SEE A53-131; Print, 1850 Masonic Union in the Art Collection to view more of the History of the Union of The St. Johns' Grand Lodge and the Grand Lodge of New York. ]<br><br>Benevolent Lodge No. 28 merged on February 13, 1974 with Independent Royal Arch Lodge No. 2, New York, NY. William Cuscaden was first seen on the annual return of December 27, 1823 - December 27, 1824. He served as Senior Deacon in 1825 and as Junior Warden in 1826. There is no record of him serving in any office in 1827 or 1828, but on December 8, 1829 he was elected Master of the Lodge. William Cuscaden was elected on September 27, 1837 to the office of the Grand Treasurer for the first St. John's Grand Lodge. He served as Grand Treasurer from September 15, 1837 until December 5, 1837, where the list of officers shows Alexander Cuscaden taking over as Grand Treasurer, while William Cuscaden was serving as Grand Marshal. Alexander remained as Grand Treasurer until only March 6, 1838, and returning to the office on March 5, 1839. William served as Grand Marshal up to March 5, 1839, returning to the office from June 4, 1839 to December 3, 1839; and from December 27, 1839 to March 10, 1840; from June 2, 1840 to September 1, 1840, on which date he was appointed as Senior Grand Deacon. He served as such from September 1, 1840 to March 2, 1841. At the first meeting of the St. John's Grand Lodge, it was stated in the Preamble and Declaration of Rights and Independence that, "...We, the undersigned...have long witnessed, with much anxiety and pain, the unconstitutional, unjust and arbitrary proceedings of the present Grand Lodge of the State of New-York, and its subordinate Body, the Grand Steward's Lodge, whereby an odious and oppressive distinction has been created, influenced by design and sinister motive; and feeling ourselves deeply aggrieved by the more recent unjustifiable and uncharitable acts of the said Grand Steward's Lodge and Grand Lodge, whereby a large number of respectable and worthy Brethren in this City have been most unjustly, wantonly, and ruthlessly expelled from their Masonic Rights and privileges, and viewing with just abhorrence and utter astonishment, the violation of all Masonic rule and principle by the said Grand Lodge, in the proceedings had at its quarterly communication, on Wednesday Evening last, the 6th inst., whereby the respectful Appeal and Solemn Protest of the accused Brethren was contemptuously rejected - a hearing of their defence (sic) refused by resorting to mean subterfuge and base expedients - and whereby they were uncharitably pre-judged and unjustly condemned without a hearing." 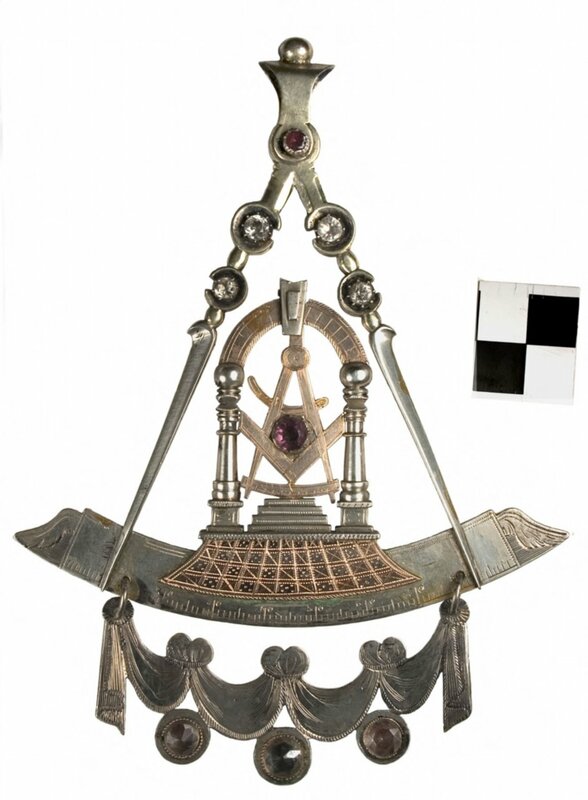 An intricate Past Master's jewel, with a large compasses that has both legs on top of a circle segment. At the top of the compasses is a rectangular loop with the top edge flared and which is surmounted by a ball. The top loop is open on either side, and is attached to the compasses hinge, within which is set a red stone. The top loop moves freely from side to side in this hinge. On each of the legs of the compasses, there are two white rhinestones set into almost complete circles of silver. The circles of silver that hold the top rhinestone pair have a small opening on the inside of the compasses, while the rhinestone pair below have small openings in the circular mount that are on the outside of the legs of the compasses. Between the rhinestones and just below the lower pair, the legs of the compasses are rounded, while the bottom portion of the compasses legs are tapered and beveled. There is a small outward-facing curl at the top of the tapered part of the compasses legs. The circle segment upon which the legs of the compasses rest has measuring lines on the lower edge, with the numbers 20, 30, 40, 50, 60, 70 and 80 engraved at each tenth marker. On the left and right sides of the circle segment there is an additional section with a wing engraved upon it, terminating in a point on either side. The area of this additional section that is beneath the wings is a field of horizontal lines. The upper edge of the circle segment has two parallel rows of dots. Suspended from two loops hanging from holes in the circle segment is a curtain that hangs down on either end, and which is gathered three times in the middle. Each gathered spot has two balls of fabric above, creating a stylized image of the top part of a heart. There are four semicircles of the curtain between and below the gathered sections. Attached beneath each gathered section is a circle, within which is a rhinestone (three total). The rhinestones are clear with the backgrounds of the left and right ones slightly pink and the background of the central rhinestone dark. Within the compasses and circle segment is a section made out of both gold and silver. The bottom part of this section is a gold trapezoid with concave sides which is affixed to the circle segment. There is a duplicate trapezoid affixed to the back of the pendant. The trapezoids are engraved with four horizontal bands and eleven vertical bands. The bands of engraving create a panel of square shapes. The square shapes are engraved in an alternating pattern of five dots on a smooth field with an "X" shape on a horizontally-lined field The top row is not a full row and the pattern is continued in it on the front but is left blank on the back. Set on top of the two gold trapezoids is a three-dimensional scene. This scene is comprised of two columns of silver with an arch of gold above. In the center of the arch is a keystone of silver which has moved slightly off-center. The keystone is vertical, slightly tapered, rectangular shape with an upper edge that is cut into a wide "V" shape. Set in the center of each side of the keystone is another vertical, slightly tapered, rectangular shape. Beneath the keystone is a gold compasses, under which is a gold square, under which is a gold circle segment. The compasses have a semi-circle of gold half-way down the legs. The legs of the compasses are engraved to look as if one is on top of the square and below the circle segment and the other is below the square and on top of the circle segment. The bottom of the gold circle segment, which has dividing lines but no numbering, is affixed to the top of four silver steps, each of which has a row of dots across it. The steps rest on the same platform as the columns. The columns have square-shaped bases that have upper and lower sections that are wider than the central square shape. On the square shape of each column base there is an engraved box that has four dots engraved on it. The reverse is the same as the front, aside from the sections which hold the stones. These are solid silver backings. Also different on the reverse is that instead of measurement markers on the large silver circle segment, the following is engraved: "Presented by Benevolent LODGE N142 to W.P.M. William Cuscaden for past services. April 12th A.L. 5851." All of the lettering is in a script font except for "LODGE; N; W.P.M. and A.L.," all of which are in capital, block lettering. The entire jewel is covered with a clear coating, most visible around the central stone, where the cut-out regions are filled with the coating. The reverse is the same as the front, aside from the sections which hold the stones. These are solid silver backings. Also different on the reverse is that instead of measurement markers on the large silver circle segment, the following is engraved: "Presented by Benevolent LODGE N142 to W.P.M. William Cuscaden for past services. April 12th A.L. 5851." All of the lettering is in a script font except for "LODGE; N; W.P.M. and A.L.," all of which are in capital, block lettering.<br>The entire jewel is covered with a clear coating, most visible around the central stone, where the cut-out regions are filled with the coating. Proceedings of a Special Grand Communication of the M..W.. Grand Lodge of the Most Ancient and Honorable Fraternity of Free and Accepted Masons of the State of New York, to Consummate the Union of the Brethren hitherto under the Jurisdiction of St. John's Grand, December 27th, A.D. 1850, A.L. 5850: Also, A Brief Narrative of the Origin, History, and Dissolution of St. John's Grand Lodge; and other Matters Interesting to the Craft, Bro. Narine, Printer, New York, 1851.